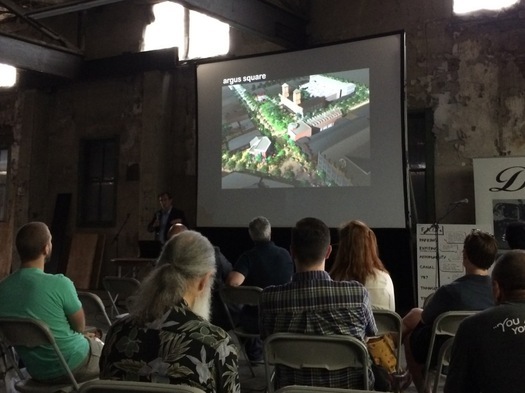 Quick follow-up on the Albany Warehouse District rezoning project: The consultants who were in town last week to study the neighborhood, talk with people, and start roughing out new guidelines for the Warehouse District presented some of their work at a public event Friday evening. The presentation included what might be possible in the neighborhood with new design standards -- and the potential transformation is significant. A couple of the renderings are after the jump, along with a few quick bits. + It's important to note from the start: What was presented Friday were draft designs and recommendations -- it's the beginning of the process, not the end. Officials have said that documents from the process will be posted on the Rezone Albany website (as of this afternoon, the presentation from last week was not, yet), so keep an eye out for that. + The consultants -- from a firm named Dover, Kohl & Partners -- clearly see potential for significant mixed-use development in the Warehouse District. 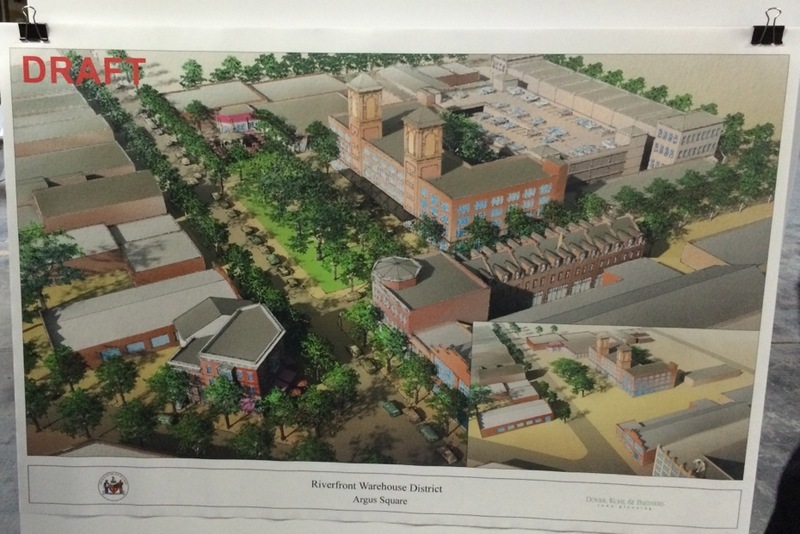 That is, development that would include residential, retail, offices, and restaurants. 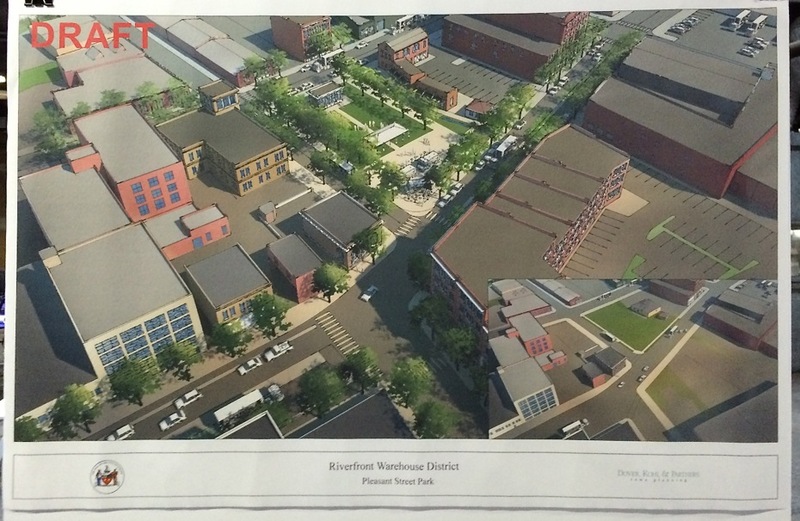 The renderings above depict a dense cluster of mixed-use buildings, both repurposed and new. + They also emphasized trying to preserve industrial uses for the neighborhood, which Dover, Kohl's Jason King described as being like "a village of makers." To that end, it appears the plan is to attempt to focus mixed-use development along Broadway while keeping other parts of the neighborhood set aside for industrial use. + As with any discussion of pretty much any project, parking popped up as an issue both during the public input session earlier in the week and during the presentation of the early design work. It was interesting to us that multiple renderings depicted parking garages constructed behind the buildings facing Broadway. King noted that one parking garage in the neighborhood could address many of the potential parking problems. + What about 787? The future of I-787 is an open question: Will it be rebuilt as it is now? Will it be turned into a boulevard? Will it be reconstructed to allow better riverfront access for people? That uncertainty presents a bit of planning problem, so the consultants mention trying to build in flexibility to account for possible future change. + And, of course, there's Central Warehouse, which Dover, Kohl's Victor Dover described as hovering over the whole scene. The consultants seemed just as stymied on the topic as most other people -- the enormous building is probably too expensive to repurpose because of its structure (and use of asbestos), and it's going to also be very experience to demolish. One idea they floated: Using the Central Warehouse essentially as a huge screen for displaying media and art. We've heard other people propose this idea, but they also added one twist to it: Displays could potentially include paid sponsorships, the money for which could be banked in a fund dedicated to eventually knocking the building down. + One thing we'll add to all this: While these incubating design guidelines and renderings point toward what could be theoretically possible in the neighborhood, they don't necessarily give an indication of what's likely. 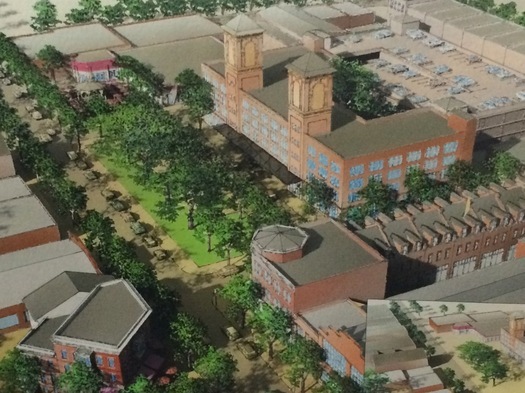 While looking over the renderings we were trying to guess how much the projects depicted might cost -- and frankly, we're not even sure how to make a guess. But it looks like the total development would be at least on the scale of the Park South redevelopment and that's pegged at a cost of $110 million. Whether there's the sort of demand -- and money -- out there for a project (or projects) on that scale is a good question. + Officials have said this sort of intensive look at a section of the city as part of the city-wide rezoning process will be repeated in other neighborhoods, and presumably they will also include public events. If you're interested in this sort of stuff, you'll probably find it worth stopping by to check out. These are very cool ideas but, frankly, the city should start by changing the zoning to mixed-use and let it happen project by project. One thing that always gets me is the fact that, if we cannot attract new residents (and we need jobs, etc, for that), we may be contributing to the development of one area at the cost of another, should people decide to move within the city. This has happened before (upper Central Ave.). I do love the concept of utilizing the current open space for more pocket parks and greenery, which adds to the walkability and softens the tone of this neighborhood, without threatening current businesses. Not too keen on the parking garage. Yes, one may be necessary, however, its a slippery sloop once you start down that path (see the traffic mayhem in Park South, where the Lords of AMC have totally dug themselves in with useless parking structures rather than investing in mass transit). Any parking garage should be met with an equally powerful mass transit option. With the BusPlus Blue Line coming down Broadway in the next year or two, this destination is ripe for a mass transit center. I can now envision the old Argus building as the perfect anchor point for such a transit center (where the Blue Line would serve as a nice 5 minute trip, hooking up with the Red and forthcoming Purple Lines downtown), with the ground floor a great location for retail and a grocery market as condos/apartments sit above. Rich, while I agree with investing in mass transit, this area is not even close to okay for a transit center. That would be an inexcusable waste. Downtown Albany, Downtown Troy, Crossgates, yes. The middle of a random street? No. A BusPlus station at most. @JayK, maybe my enthusiasm got the best of me and should have toned down my intentions. I'm not thinking transit "center" as in a juiced up facility to accommodate a ton of bus traffic, but a simple station housed alongside mixed retail within the Argus building. The current BusPlus stations are great and do provide some decent coverage from the elements, but in Europe, there are a ton of boutique bus/tram stations co-located with shopping centers, government facilities, large business, or any building that employees 500+ folks. I agree, we don't need to sink a few million into this, but maybe a $100k for a room large enough to accommodate 20-30 people who may have just wrapped up shopping and who can wait inside for the bus. Don't get me wrong, Rich, I love the enthusiasm, and wish the whole country shared it. I just tend to be more realistic of American capability. As a result, I don't see private money doing it, and it really would be a tragic waste of limited CDTA dollars. Additionally, this corridor may never have a ton of bus traffic to accommodate. Even the Central/Washington/Western corridor has only basic BusPlus stations, and more than 3 times the ridership. That's where the money should go. I think cafes and bars near bus stops are the best bet for places like this, especially with real-time arrival information now available. Lark Street is a good example, as is State and Pearl. If these plans come to fruition, the cafes won't be far behind, and we've already got the bars!